NOTE: This style has an elastic waistband and drawstring. Lay garment flat and use a tape measure or ruler. 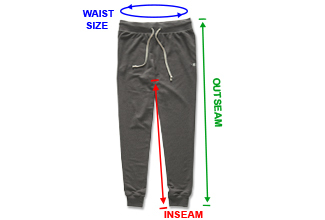 INSEAM: Measure from the seam connecting the legs together to the seam at the bottom hem of the garment. OUTSEAM: Measure along the outer edge of the garment. Start at the top of the waistband and end at the bottom hem.